I am getting my fast car soon…working on it daily and my slow car is going a little faster each day. What I mean is, things have changed and I get to learn to manage time differently. Guilty of wasting a bunch of that precious stuff (time) everyday, I now get to take count of every minute of it. I used to get up and do whatever I wanted or felt prompted to do and then TV, Facebook and phone were a very big distraction. Now that there is a new job…things had to change. I get up earlier to make sure reading, exercise, shower and journaling are done daily…even before carpool! That is a first. Working from home is awesome, and…it requires that you stick to your schedule…a lot of things can get in the way…did I say A LOT of things can get in the way? I am grateful to be learning this lesson and taking full advantage of it. We are each given the same 24 hours in a day. No rollover, advanced withdraw or freezing in time allowed. Time will go and we will do with it as we will. I am so very grateful to know this! To apply this and to see the change it is bringing in my heart. Life is fantastic, I just get to enjoy it regularly and constantly, not in spurts. I found that time managing has made me more productive and happier. No more guilt on wasted time because there is no more waste! So, writing has to be worked into my schedule…I am getting there. I miss writing here. Watch out…I am coming back! I am an only child of divorced parents. My residence is in the United States. I am originally from Brazil. So my parents are still there. They are both remarried. My dad is from Korea and so is his wife. My mom is from Brazil and so is her husband. My mom married someone her senior by 25 years. My dad married someone younger than him by 20 years. After I got off the phone with her, I was telling Kurt what had happened and expressed my frustration on the limitation of what I could do from here and the lack of a sibling to help out. Yup, I didn’t have an answer to that one. I am praying a lot. Doing my part here in serving others and hopefully it gets there. It has happened in the past. 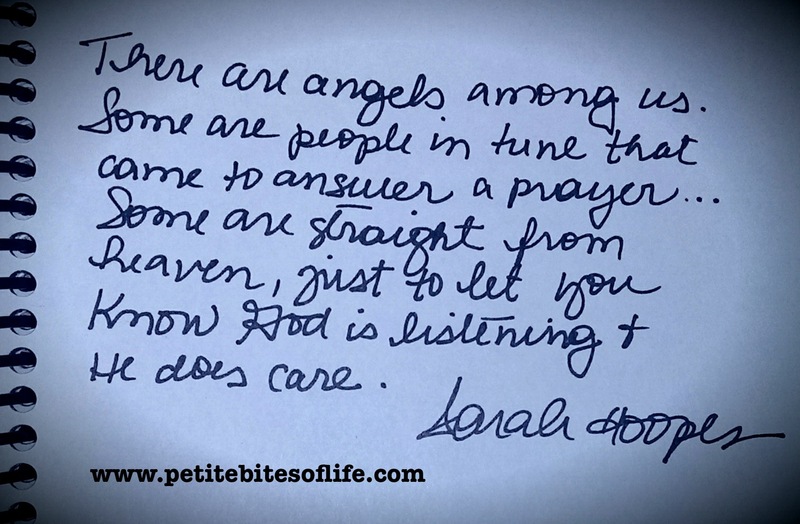 I am so grateful for love notes from heaven. When we get frustrated or discouraged…the Lord is right there with us. We just got to trust and know that everything is working out the very best way for those involved. I feel blessed and know that my parents will be blessed too. I have enough faith for that. How Long Until I Get to the Bottom of the Pit? A while back I wrote about when you hit bottom, the only way out is up. Someone asked me to write a little bit more about it…So here I am. I must start by explaining that I was a very negative person. Everything had something bad in it for me and everybody was having a better life than mine. That is how I was raised and how the circumstances around me evolved. Or so I saw them. If you have a lot of awful things in your life…and there are many that do…it is up to you to drawn in the bad of it or to soar because you have faith. Always a choice; nobody can make anybody do anything. We allow people to change our behavior, how we feel and worse…what we think. Because there are many people in my life, sometimes I get to see things up close and personal. I have seen people dwell and live for victimhood…and I’ve seen people go through many horrific trials and you would never know they were going through their personal Gethsemane. 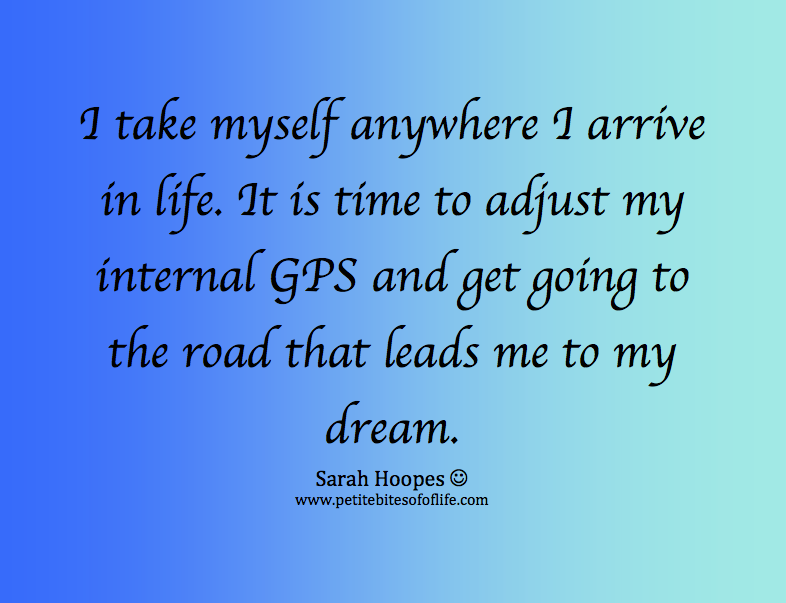 Our attitude in life decides where we are in life. When I was a victim that was offended by anything that was said in the room, I had the tendency to look for people, words and events to be my excuse to be where I was. I also allowed things to hurt me deeply…not forgiving for a long time. That is a great formula for disaster! I hit the bottom of my barrel when suicide became an option. I am here to tell you, there is no more scary place to be than that one. Where discouragement is so great that you don’t want to wake up in the morning. Even though you have every reason to look forward to waking up (you are healthy, married the love of your life, have 2 beautiful girls to raise, a home…), you are disappointed when you do. I had to take a hard long look at who I was at the age 24. Was my life enough for me to have joy? Was I headed to a good place? At 24 I began to discover myself…for the first time. To learn who I was and my potential was a painful experience. I had to face the parts of me that are the worse of me, that only God and I know where they exist (sometimes my loved ones get to see them…working on healing those parts, and letting them go)…and I had to recognize that not all of me was made of the worse parts. Once I saw what I had to work with, I had to learn to love myself for who I am right now, not who I was yesterday or who I am becoming tomorrow. To change my behavior, I had to change my thinking and then be vigilant, old habits are persistent in coming in. When the thought of ‘that was hurtful, they are so mean to me’ came to mind…I replaced it with ‘I wonder why they are hurting. I wonder if I can help them out.’ You see, when things stopped being about me, or how people are so mean, I became much more aware that others hurt too, and what they do is because they are not feeling good about themselves, life or other people. Life becomes awesome when we can see through someone else’s lenses. It ceases to be about ourselves, our issues, our pain, our anger…it becomes fun to serve and help someone else out. By doing that, we learn to forgive sooner than later, it was not about you anyway…so it is easier to let go. 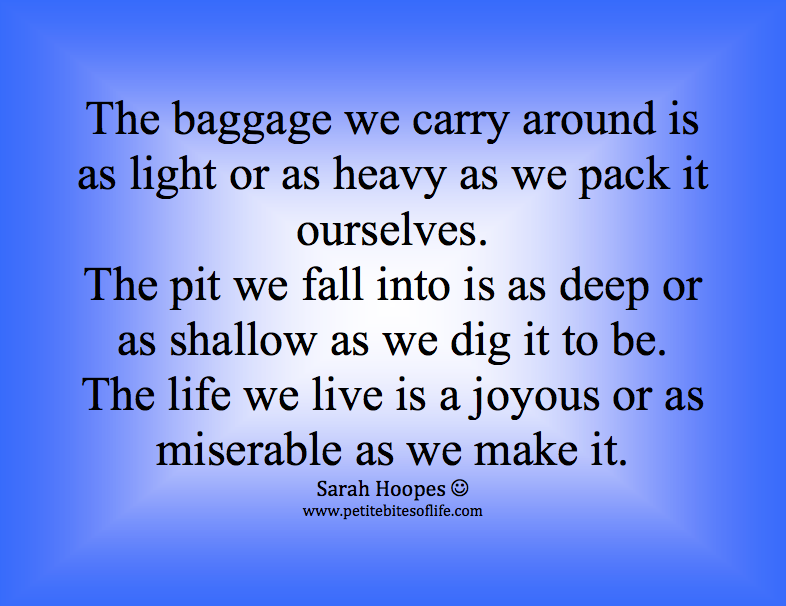 The baggage we choose to carry around is as heavy as we pack it! The choice is always ours to what we do, where we go and who we are. If we don’t like what we are experiencing, the power to change is within. It took time to get where we are, so it will take time to change it. When we don’t give up and keep on going strong, we can change from a life of addiction, depression, fear, anger and very negative thoughts to a life of unconditional love, happiness, joy, courage, peace, and most important freedom to be who we are created to be. Join me on the journey of change?